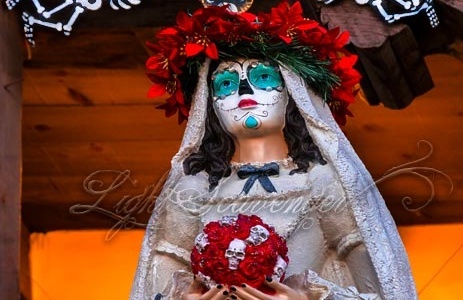 One of the best versions of Santa Muerte ever, in a photo I took last Christmas Eve in Old Town Albuquerque. The Marigold Parade was today. It’s basically a large, quirky, and very exuberant party that moves through Albuquerque’s South Valley each year, celebrating Día de los Muertos. I was able to capture one drummer in the reflective sunglasses of another as they played.